In the recent past there has been increased environmental pollution which led to the Kenyan government banning the use of plastic bags in August 2017. The ban meant that anyone manufacturing, selling or using plastic bags would be liable for a fine or imprisonment, or both. 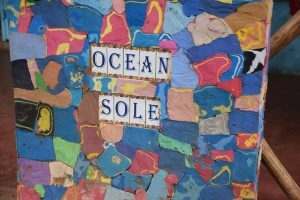 In in the outskirts of Nairobi, at the Karen Village, we find Ocean Sole, a company started in 1999 by Julie Church. Ocean Sole was started with an aim to help clean up beaches along the coast of Kenya. 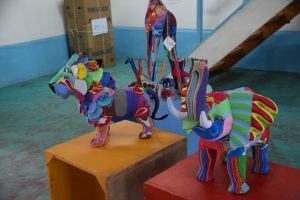 It started through collection of flip flops along the beaches and recycling them to create various artifacts. This was aimed at keeping our environment clean and also safe for the various creatures living in water. Currently they are able to collect flip flops from the Indian Ocean, water ways and in dumpsites after which they are cleaned and recycled. According to Maureen, the Assistant Production Manager at Ocean Sole, the flip flops are thoroughly cleaned and disinfected. They are later sun dried or dried in a kiln, after which, some are turned into blocks. These will be curved into various shapes depending on the artifact to be produced. It is important to note that for the production of big artifacts, Styrofoam is used as it is of less weight. Through this act of environmental conservation, tens of jobs have been created. We meet Caroline Obonyo has worked for Ocean Sole for the last 13 years. She started with beading and making of bracelets, earrings and necklaces later doing blocks for making various shapes that are later used to curve various artifacts. She says that she has been able to sustain herself as well as educate her children. It is of less hustle getting flip flops during the rainy seasons. An explanation to this is partially attributed to the fact that most people have their flip flops damaged in mud, hence get rid of them. They are then washed away in rain water. On the flip side though, Maureen informs us that it is expensive to dry the raw materials during these rainy seasons, as they mostly rely on their kilns. The other challenge they get to face is that most of the time it’s difficult to come across white or yellow flip flops as most are multicolored thus not able to create, say for example a zebra which is black and white in color. These pieces are sold locally and internationally, with the international market performing better than the local one.